Avid readers of this site will recall that Editor Watts enjoyed fabulous powder in the Les Houches area of Chamonix’s skiing on the last two days of his January visit. See his report on that. On the first two days he enjoyed skiing under clear skies on two of Chamonix’s higher ski areas. On Sunday, after a transfer from Megève, Dave skied wintry packed powder on-piste and off at the ski area furthest from town. The sunny Balme area is accessed from the village of Le Tour, easily reached by free ski bus from Chamonix. It seems less popular than the areas closer to Chamonix but is well worth a visit. After a wonderful few hours skiing with Claire Burnet from the Chamonix Tourist Office, we enjoyed a delicious lunch of rabbit with parsnip and potato purée at the tiny Alpage de Balme mountain hut. It has mainly gentle pistes suited best to intermediates, plus an excellent, separate, quiet beginner area, served by chair- and drag-lifts. The off-piste is equally gentle and I returned the next afternoon with Frederic, a mountain guide from Evolution 2. which offers a wide variety of courses and guiding (including 3-day All Mountain guiding). We skied a couple of lovely gentle off-piste runs, including one through the forest where the snow was untouched days after the last snowfall. Balme is quite a contrast to the Grands Montets ski area, which has much steeper slopes which get tracked out just a few hours after a snowfall. I skied the Grands Montets on Monday morning before moving on to Balme. The long and wide Combe de la Pendant bowl was mogulled from top to bottom – and in the shade all morning, as were the other runs on the Grands Montets. My visit was organized by the Chamonix Tourist Office and Crystal Ski and I stayed at the very atmospheric Hotel Gustavia, right opposite Chamonix train station. Crystal’s prices start at £662 per person for two sharing a room, including half-board and flights and transfers. 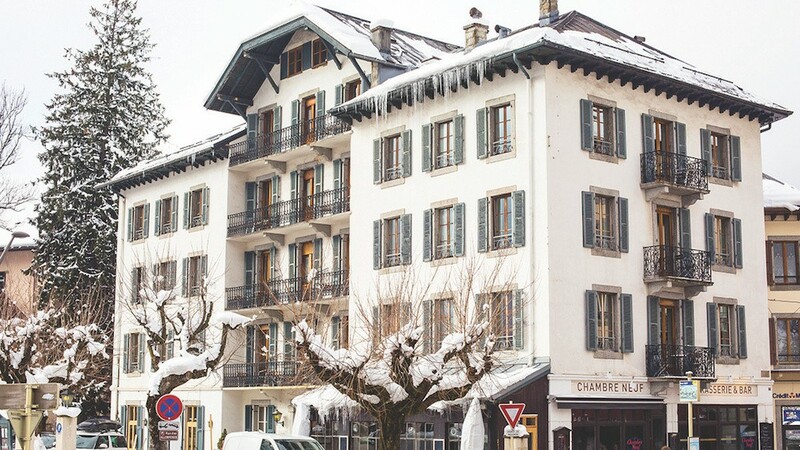 The Gustavia is part of the Scandinavian Langley Hotels group, which has eight hotels in the Alps featured by Crystal. Langley has an impressive record of renovating hotels it takes over in a ‘modern alpine’ fashion. It is part way through renovating the Victorian-style Gustavia and has finished the top two floors. I stayed in Room 405, which was vast, with a wooden floor and two huge French windows with balconies and fab views of Mont Blanc. All the bathrooms in the hotel have been redone as wet rooms with showers not baths. The half-board food was good and the hotel bar (Chambre Neuf) is a classic après-ski bar with a live band and huge crowds from 6pm to 8pm daily (except Saturday). But my favourite food of the trip was in the restaurant of the 5-star Mont Blanc hotel’s Matafan restaurant. The black truffle risotto and chocolate and passion fruit tarte were truly delightful and worthy of a Michelin star (which the chef had earned at his previous gaff running the Bistro at Hotel Morgane). And the dinner menu is very reasonably priced for such high quality food at €35 for two courses (24€ at lunchtime).